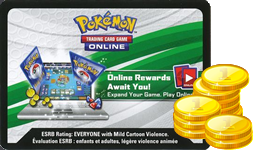 After a specific promo card for your deck in the Pokemon Trading Card Online? These codes are all for online versions of the Promo Cards that came in checklane blisters, 1 pack, 2 pack or 3 pack blisters. They are not booster codes, they unlock a specific card and sometimes an online flipping coin. 1x Alolan Vulpix Online Code Card from an Ultra Prism Checklane Blister. This code unlocks digital o.. This code is from the Gigalith Battle CLB. These rewards can all be redeemed in the Pokemon Trading .. This code is from the Sharpedo Battle CLB. These rewards can all be redeemed in the Pokemon Trading .. This online code unlocks the promo Giratina card which was included with mixed XY series CLB's. It..
1x Kirlia Online Code Card from an Ultra Prism Checklane Blister. This code unlocks digital online r.. This code is from the Sun & Moon Guardians Rising Checklane Blister featuring the Lurantis Pro..